After clearing out the building of all furniture and turning off the utilities, it’s time to get inside the walls and pull out anything that can be reused or recycled, like copper wires or pipes. Selling certain materials to recycling facilities, for example, can help you recoup some of the cost of demolition. But more importantly, it helps to keep the price of precious metals reasonable when everyone does their share of recycling. Take the time to gently remove certain reusable features by hand as well. For example, if you are demolishing a home with an antique fireplace, carefully remove the mantle and the original stones for future use. Local restoration societies may be interested in purchasing these materials from you, or you can incorporate them into future designs. Some commercial buildings might have tiles or glass windows that can also be removed and reused or recycled. It’s wise to over the building in detail and do a cost analysis on the value of the recyclable materials. Sometimes, it just won’t be worth the time and effort of your crew to remove some things due to a large market supply. However, most buildings contain over 80% reusable materials that can be removed before the building itself is torn down. Even the materials with low market value can be ground down into an aggregate. 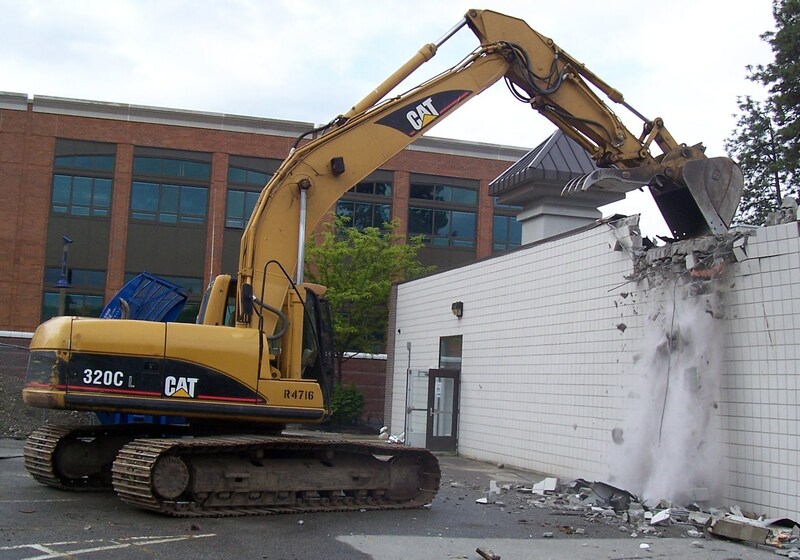 Good demolition teams try to go the extra mile rather than cut corners, so do try to recycle what you can. You could face some heavy penalties if you demolish a building without removing asbestos first. Asbestos is made of fine particles that can cause severe lung damage if they are inhaled. To remove asbestos, you may first need to get a permit. If you don’t feel comfortable or confident handling the asbestos removal yourself, call in a professional asbestos abatement team. Because a mistake can be very hazardous to your health and the health of others in your area, this isn’t a time to DIY and learn as you go. At the very least, ask an experienced asbestos removal professional to supervise and guide you. It will be worth it. To start, you’ll need safety equipment. A full-body suit will prevent particles from settling onto your clothes, and a high-quality breathing mask will protect your lungs from these glass-like particles. Next, you’ll need to seal off all openings in the room to create a negative air flow. This will contain the asbestos particles and prevent them from being scattered into the air. Take great care to avoid breaking asbestos materials during removal, as this is when the fine particles will be released into the air. Older homes and buildings likely contain not only asbestos products, but also lead paint. Lead paint produces a fine, powdery dust that is easily inhaled. This can cause lead poisoning, a potentially fatal medical condition. In non-fatal instances of lead poisoning, the body can suffer irreparable damage. Children are particularly susceptible to lead poisoning, and they only need to be exposed to minute amounts in order to experience serious effects. By not properly disposing of materials containing lead-based paint, lead dust can be spread into the surrounding community, where children can come into contact with it on sidewalks, benches, playgrounds or by breathing contaminated air. The EPA’s regulations surrounding lead-based renovations do not apply to full demolitions. Despite this loophole, it is better to take the right precautions to protect yourself, your crew and your community from harmful lead exposure during a full demolition. The EPA’s lead removal training program is a good place to begin your education. As you can see, demolition dangers exist well before any powerful machines are brought in to tear down the building. Before you ready the wrecking ball on demolition day, make sure the area is secure in order to prevent anyone from wandering too close. There is a risk for flying debris, so make sure everyone within certain proximity is wearing hardhats and other protective gear, such as protective eyewear or boots. Once the building has been reduced to a pile of rubble, it’s time to do a site clean-up. Then the land can be prepped and a new building can be constructed in its place.